How Muslims are treated in the U.S.A. I am reminded that standing against such actions by speaking out, even if imperfectly, disrupts the silence that perpetuates racism. The video also demonstrates the common humanity we have with each other if we can discard the stereotypes we have been given about people who we think are different from us. The people who speak out in this video give me hope. I’m reading a book called How does it feel to be a problem? 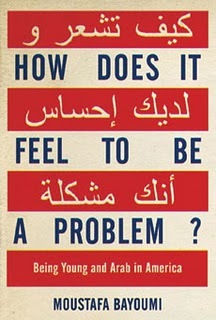 Being young and Arab in America by Moustafa Bayoumi. It’s a collection of personal stories of seven young Arab and Muslim Americans from Brooklyn and how they live their lives as members of what the author calls “communities of suspicion.” It is challenging me to confront the stereotypes that still reside within me. I think the speaking out has to be done to oneself as well as towards others.